On Controller line #36, return ModelState's valid status and its errors (model-level errors and property-level errors), we segregate those two errors so it's easier on jQuery's side to process those. The model and its server-level validations. These validations can be instantly seen on client-side(no page refresh) without doing a page roundtrip, use the jQuery library before the screenshots guide. 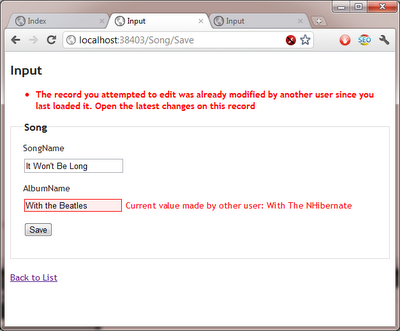 Below is the corresponding HtmlHelper, API-wise, it behaves exactly the same as its eight Html.ValidationSummary cousin. In fact, it's safe to keep Html.JsAccessibleValidationSummary in your code even you will not use IValidatableObject client-side validation. Loving extension methods :-) Click the Expand Source. Actually, it's the combo of context.YourSourceDbSetHere.AsNoTracking() and context.DestinationDbSetHere.Add(context.YourSourceDbSetHere.Find(pk)) that is dangerous. There's no clean way for a stub/proxy object (an object with only had its ID property set, the rest of the properties are left with their default value(i.e. 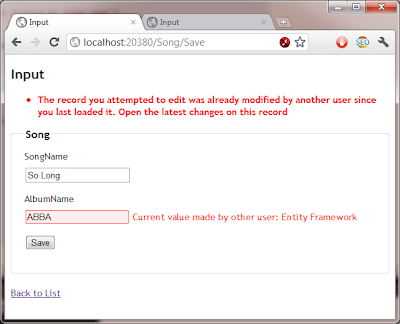 null, empty string, zero, etc)) to represent an entity on many-to-many inserts. // when the associated Genre(s) is modified. // June 3, 2012: Above comment is stale already. For detecting concurrent update, use TimeStamp attribute instead of dirtying-technique+Concurrency attribute combo technique. 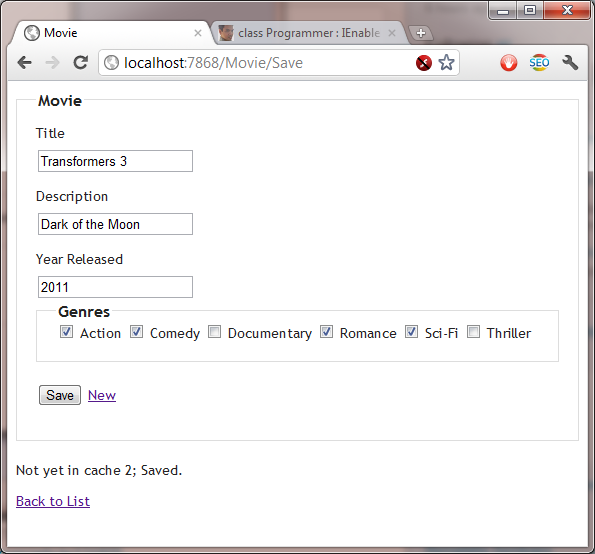 // No need to remove TheMovie.Version, ASP.NET MVC is not preserving the ModelState of variables with byte array type. To solve that problem, monitor your context's ChangeTracker, line #35 to 47. Even you are using AsNoTracking, line #35 to 47 will not make a database roundtrip to fetch the Genre's row(s), inserting into many-to-many table will be streamlined. Entity Framework: Representing an entity with a stub/proxy object is a one big exercise of leaky abstraction. Even though concatenation approach is performant and lighter on network traffic(but don't do micro-optimizations), you will eschew the concatenation approach in favor of the first code. The reasons are twofold; first, you can't guarantee that you can safeguard your query from SQL-injection; second, code-review-wise, you don't want your code be flagged as having a code smell, the second approach is longer and look every bit as brittle. Linq-chaining has the advantage of preventing Sql-injection while maintaining the advantage of strongly-typed(as opposed to stringly-typed programming, e.g. concatenation) programming, strongly-typed means less error, you have autocomplete at your fingertips when you are using an IDE, and you have a code that is refactoring-friendly anytime. And last but not the least, with Linq you'll have more confidence the program is correct even before it is run. Approach 2. Don't worry, parenthesis isn't required, compiler is not confused where the Linq boundaries end, think of from having a built-in open parenthesis, and select having a built-in close parenthesis. Here's the LoadStub extension method. If we could know how to get the primary key name of an entity, we will remove the primayKeyName property in code. For now, the convention-over configuration(using Entity name + ID as the default primary key) could prevent explicitly passing the primary key name. Using checkboxes is a many-to-many design. In this post, I'll show you how to make the process of inserting to a third table a fairly automatic process with Entity Framework. The only difference is in the way the model is being saved. ORM mapping. We have three tables, namely Movie, Genre, and MovieAssocGenre. Contrast with Entity Framework which need work-around(connected mode simulation) when it is working in disconnected state, NHibernate don't need any of that. NHibernate concurrent update is automatically handled behind the scene, no need to introduce any code to make NHibernate be informed which column(rowversion) is not needed on UPDATE's SET clause, what you just need is to inform NHibernate which property is your rowversion column, and no need to simulate connected mode. // To facilitate concurrency checks, do these two lines. // When EF perform an update, it compares the DB value from OriginalValue. 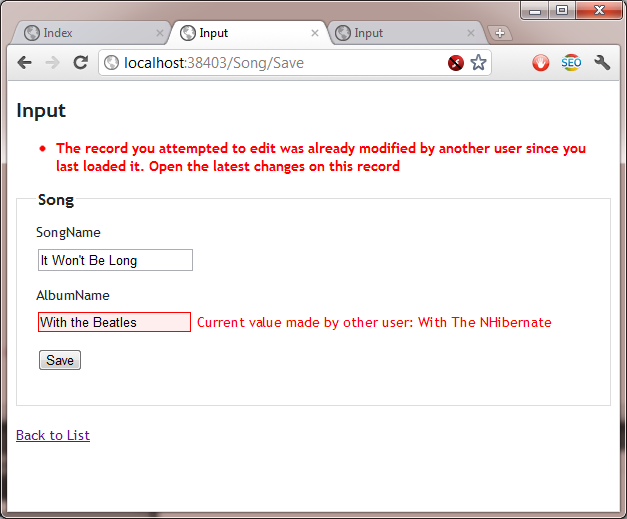 // There's too much implicitness here, UpdateModel get values from Request.Form/Request.QueryString, Model Binding (variable song) isn't of much use here. // Is Model Binding useless on EF? and add the Save action below. 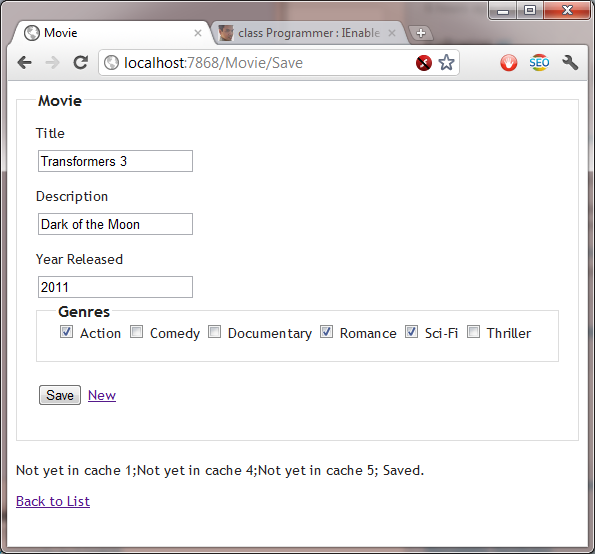 Note line #11, if the user don't check anything, the SelectedGenres won't be populated by ASP.NET MVC, and will be left as null. 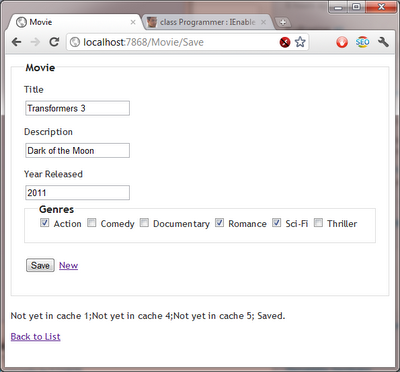 Note line #16, that pushes the selected genres by a user to Movie's Genre collection, use Load, don't use Get. When saving the third table, we are not interested on getting the genre record from database, only its ID(which is already known by the application, database round-trip is not necessary and will not happen), Load prevents eager fetching of object from database. Load doesn't hit the database, it just prepare the object's proxy by assigning it an ID; which when it's time for the program to access the object's properties other than the object ID, that's the time the object will hit the database(to fetch the rest of the properties of the object) by means of its ID(primary key). 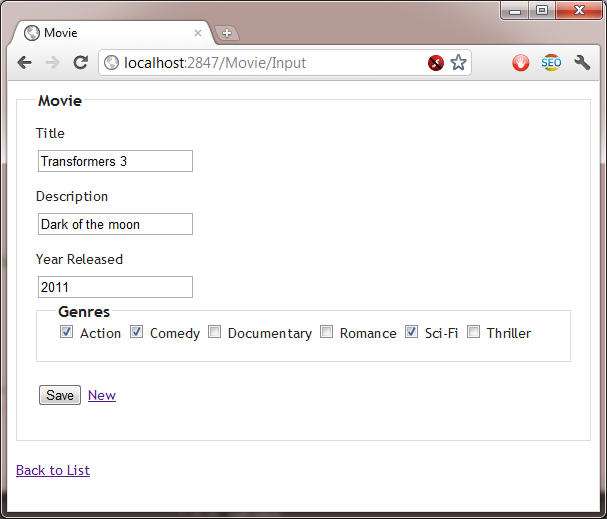 s.SaveOrUpdate(input.TheMovie); // Primary key(MovieId) is automatically set with SaveOrUpdate, and the row version (Version) field too. 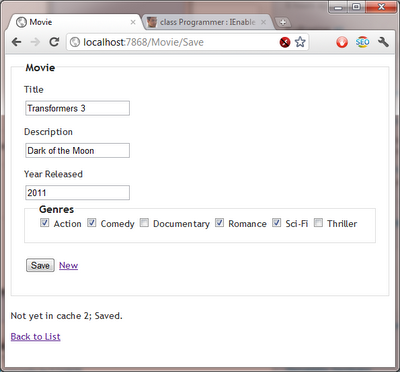 Note on Save code last line, we just re-use the Input's view. Uses automapping via Fluent NHibernate. The third table(MovieAssocGenre) is in line 38,39. Start embracing the five pillars of maintainable software: ORM, the MVC pattern, unit testing, mocking, IoC. An advice to Microsoft toolchain users. Embrace what they churn out these past years. 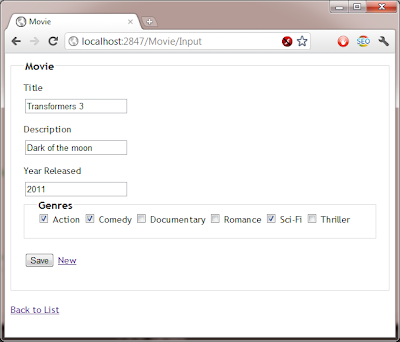 ASP.NET MVC, Entity Framework, Code-first EF(i.e. model-centric coding, not to be confused with designer), jQuery(not made by Microsoft, but now has a blessing from them). They deliver nice technologies way very late, it's a disservice to your skillset if you will not quickly learn these enabling technologies. Microsoft is already late, don't let yourself be late with Microsoft's latest technology. See? how long before Microsoft "legitimizes" certain technologies to the eyes of many Microsoft tools-using devs. And what's the year now? 2011. Hiding in the cave? WCF error. The underlying connection was closed: The connection was closed unexpectedly.